PTG Lab looking for new members! The PTG lab is looking for one or two additional research assistants to begin in the Fall 2013 semester. New research assistants must be an enrolled OU student, and must be able to commit 10 hours per week to this lab. If you are interested in applying for this position, please contact the current research assistant to the lab, Kellie McGuire, klmcguir@oakland.edu. The third workshop of PTG and Resilience was successfully held at the National Cancer Center Hospital (click the picture to read more about the location) by Dr. Kanako Taku and Dr. Ken Shimizu. Psychologists, psychiatrists, physicians, nurses, social workers, educators, teachers, researchers, graduate students and many others attend the workshop. The attendees exchanged their opinions about PTG and resilience from various angles. The Japanese version of the summary of the workshop can be found here. Dr. Taku just recently finished her new study in Japan. The purpose of this study is to examine how core beliefs, rumination and subjective perceptions of the earthquake that hit Japan on March 11, 2011, would correlate with posttraumatic growth and distress. Dr. Taku conducted this survey in the beginning of June. Approximately 300 Japanese undergraduate students participated in her new study. We are currently in the process of creating the coding manual for this study for data entry. More to come soon! 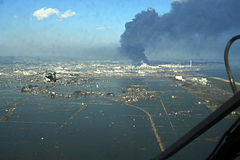 To read more about this earthquake, click here to find how the size and magnitude affected Japan. Congratulations are in order! Online Schools Michigan has created a list of the top 25 psychology professor in Michigan based on recent awards in teaching, research and scholarship. Oakland University’s very own Dr. Taku was selected to be placed among this list based on her research endeavors in clinical psychology, cross-cultural psychology and trauma psychology. Click here to see the full list of 25. Aside from these features and for more news, Dr. Taku recently presented her study about posttraumatic growth and how culture affects the mechanisms of a triggering event (Challenges of core beliefs -> cognitive processing -> social support -> PTG) at various universities including Tsukuba University and Waseda University. 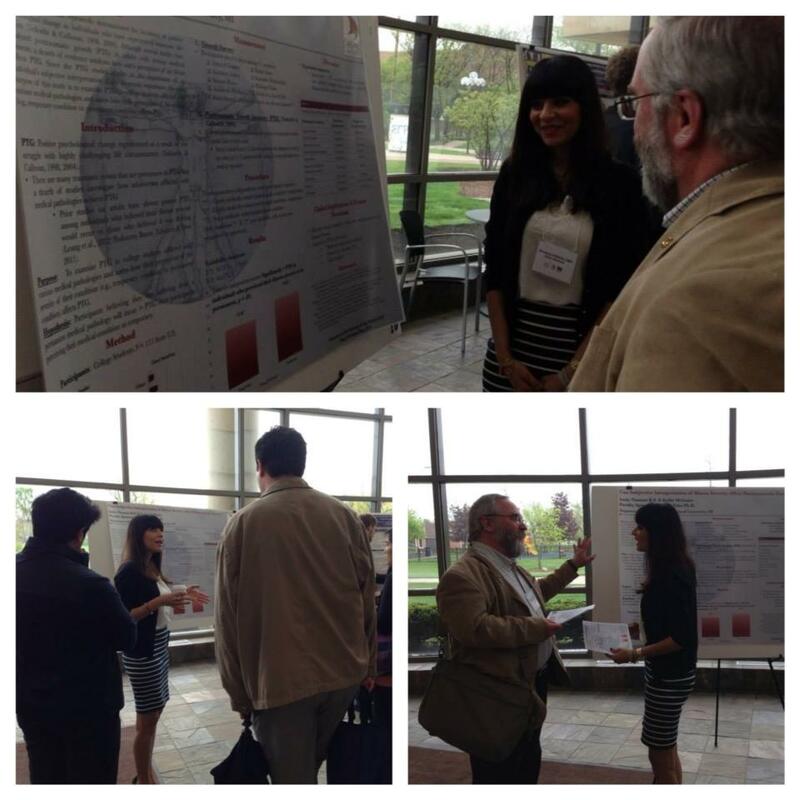 The most recent conference that the PTG lab attended was the Meeting of the Minds Conference, located at U of M-Flint on May 10th, 2013. 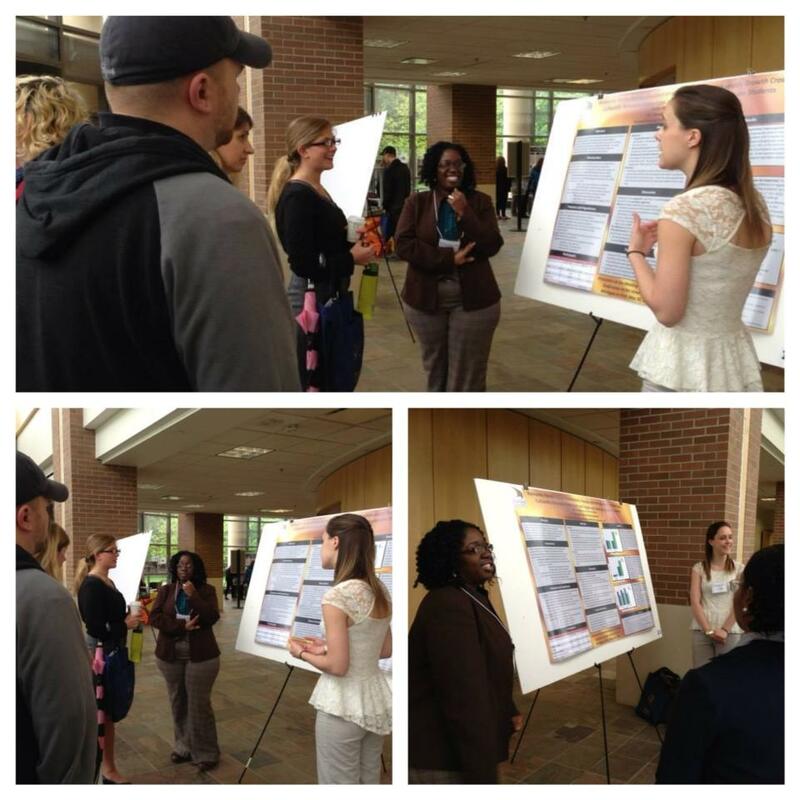 The members had a total of two poster presentations, and one oral presentation. Elam, S., & McGuire, K. The Influence of Disclosure and Religiosity on the Posttraumatic Growth of Bereaved Adolescents. Results of this study showed that there were significant differences for those who did and did not disclose about death in the domains of Relating to Others and New Possibilities. Also, disclosing about the death in detail shows strong significance in the domain of Personal Strength. Thomas, I., & McGuire, K. A Matter of Perception: Contrasting Posttraumatic Growth in Temporary and Permanent Medical Pathologies of American College Students. Results of this study showed that participants who perceived their medical pathology as a permanent condition experienced significantly higher PTG. McGuire, K., & Elam, S. Romantic Relationship Dissolutions: Assessing Posttraumatic Growth Cross-Culturally Between American and Japanese Undergraduate Students. Results of this study showed that American students have more experiences with romantic problems overall, but there are no significant differences in reports of romantic problem as “most stressful” between American and Japanese students. Overall significant differences were also found in level of PTG experienced in both American and Japanese students. This was another great experience for the PTG lab, allowing them to present their own research to faculty members and other students. They were able to engage in conversation with other student researchers from U of M-Dearborn, U of M-Flint, and Oakland University. Another job well done! The first of two conferences attended this past semester was the Midwestern Psychological Association Conference in downtown Chicago. The conference was held at the Palmer House from May 2nd-4th. Both presentations given by the lab members included posters. 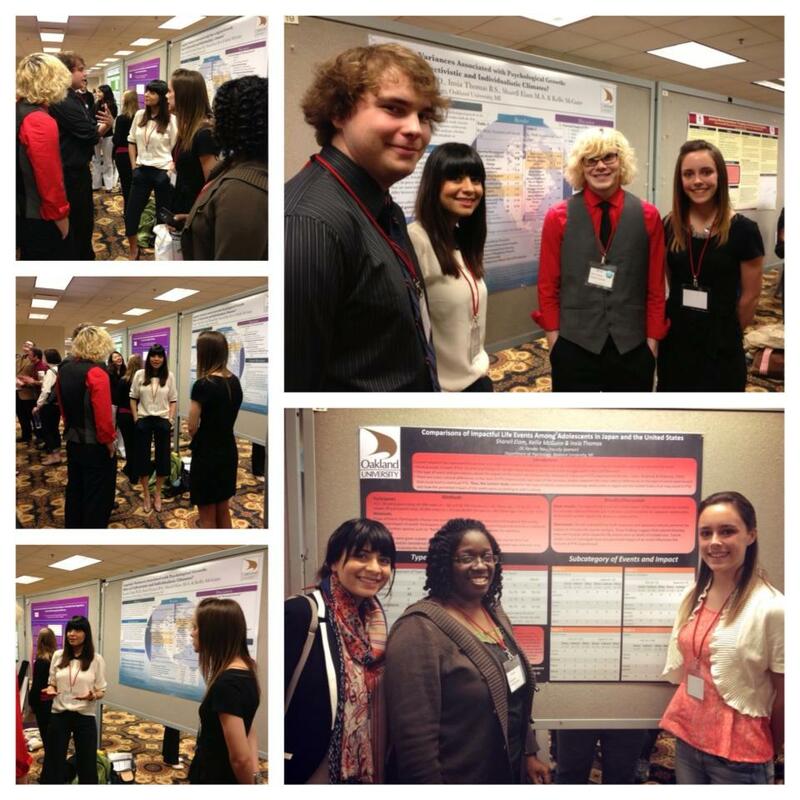 Along with the lab members, Dr. Taku also had a successful poster presentation at MPA. Taku, K., Thomas, I., Elam, S., & McGuire, K. Linguistic Variances Associated with Psychological Growth: Effect of Collectivistic and Individualistic Climates. Elam, S., McGuire, K., Thomas, I. Comparisons of Impactful Life Events among Adolescents in Japan and the United States. Taku, K. Within-Individual Variability as an Index of Posttraumatic Growth. This was an overall great experience for the PTG lab members, allowing them to engage with student researchers from all over the country and educating themselves with different studies. Aside from work, the lab members were able to explore downtown Chicago!